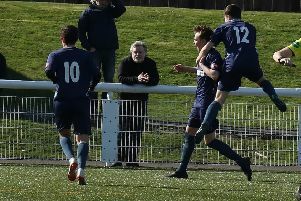 A 1-0 victory over Crichton means that for the first time in more than 20 years Saint Cuthbert Wanderers are South of Scotland League Champions. The title winning goal was scored by Bryce Wilson who put in a man of the match performance on Wednesday night. Tonight (Friday) sees Heston Rovers locking horns with the new champions. A real mixed bag of fixtures are scheduled to be played over the next week as football in the South of Scotland League draws to a close for the season. On Saturday Nithsdale Wanderers play hosts to Fleet Star at Sanquhar for a match that could go either way, and although Star took the plaudits the last time those two met recently this time around could see the teams sharing the points. Wigtown and Bladnoch entertain Edusport Academy at Trammondford Park for what could be another close run contest although the visitors could well start as favourites to take the three points with much depending on what playing personnel the visitors turn out. There are also three Tweedie Cup second round ties being played on Saturday with all of them looking like very evenly balanced matches. Crichton play Creetown at Hospital Park and will start as favourites to progress although the young visiting side are more than capable of coming home as victors if they play to their best form. Lochar Thistle entertain Mid-Annandale for a contest that could possibly take more than the regulation ninety minutes to find a winner while the same could be said about the match at Moffat where Upper Annandale have Newton Stewart as their visitors. There are two South of Scotland League matches being played on Monday evening with Wigtown and Bladnoch travelling to Dumfries to play Lochar Thistle while Upper Annandale have Nithsdale Wanderers as their visitors to Moffat. In the first round of the Potts Cup Creetown play hosts to Fleet Star and look the more likelier of the teams to progress. There are three League matches scheduled for Wednesday evening with the local derby at Hospital Park between Crichton and Lochar Thistle looking like a match that is evenly balanced while Mid-Annandale could return from their trip to play Nithsdale Wanderers with the three points. Upper-Annandale should also take the points from their match against Dumfries YMCA which is being played at Moffat. Edusport and Wigtown face each other again in the semi-final of the South League Cup but this time around Edu have home advantage and could well make it through to the Final. In the semi-final of the Cree Lodge Cup Fleet Star will have their hands full as they take on near neighbours St Cuthbert Wanderers at Gatehouse with the visitors strong favourites to progress to the Final of this particular competition.